Last month I came across a decorating challenged to take one space and decorate it a new way each month using items already owned. It was a no cost decorating challenge. If you would like to take a look at some great looking spaces, you can see it here. I discovered this challenge a little too late in the game, but it made me start to think about my own space. Could I decorate or redecorate my home without purchaseing new items? I was up for this personal challenge. My first attemp at this challenge was shared in my Pottery Barn Look Alike post. I attempted to recreate a staged bed that I spied at Pottery Barn from shopping my own stash. I was pleased at it’s result. My next space I would like to attempt is my home office, particularlly my desk. A while back, I did gather some items from various Friday Find sprees to use in accessorizing my desk. However, I really did not go much farther than that. Not sure why…. I gusess I needed to see how I was going to use my desk and what exactly I nedded to make it functional. Here is the result. Do I think it will stay this way, clutter free? Um no! But the added owl accents do make me smile every time I sit down. Oh do you spy the white moose container to the left of the monitor? It was an impulse purchase I made. I swear it called out to me to take it home. I love a little whimsy. So if you want to get technical, this was not completely a no cost decorating success but I sm liking it. 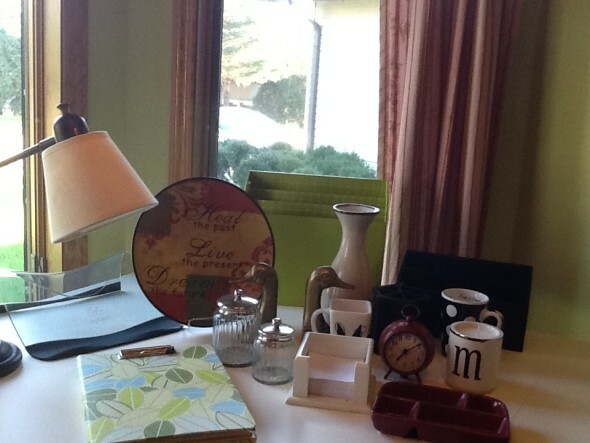 Tell me , how do you keep your work space clutter free? Or do you? Love your decor choices and it doesn’t look overcrowded or cluttered! I love all the little touches that you gave your desk..such personality and inspiration! My desk always seems to be cluttered. Have a great day. Wow! I love the “brightness” and the transformation – light, bright and airy! Great job! Looks great! I love that it’s so light and airy! Love the owl accents, especially the book holder owl, or whatever that is. Cute! Those owls do make me smile every time I sit down. A little fun with work is ok..
Love the new look. It is beautiful! And Lol and not keeping it neat all the time….I am with you on this one. I loved your pottery barn bed redo too! 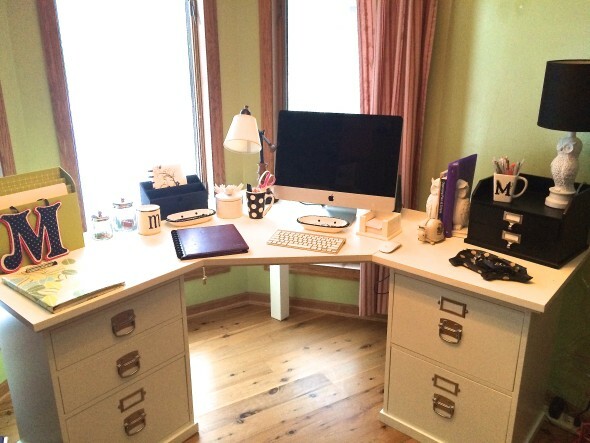 The corner desk makes me swoon. I need to get one like that – and I have just to place for it. Yes I love it too. It was a craigslist find. We generally keep the desk clutter free by making all of our piles on the other surfaces in the home office 🙂 Cute décor.